Revelstoke Bear Aware works to keep bears wild and our community safe. We identify and document the presence of bear attractants. We monitor the presence and activities of bears in our community. We educate our citizens and businesses about how to eliminate or reduce the bear attractants for which they are responsible, and help them to do this. We advocate for local management that minimizes bear/human conflicts. We instill a sense of respect for bears as co-inhabitants of our landscape. Presentations. We educate school groups, summer camps, pre-schools, and other community groups upon request. Festivals and community events. Revelstoke Bear Aware attends many local events and festivals. Website. Our website offers information about bears and reducing attractants. Map of bear sightings. Residents can view an interactive map on our website to see recent bear sightings. Door-to-door visits. In neighbourhoods with high bear activity we will initiate a door-to-door educational campaign. Garbage tagging. Residents who put garbage cans on the curb the night before pick up may have a “Bear Attractant” sticker places on their garbage can to remind them to store garbage properly. Locations that are tagged are reported to Revelstoke’s bylaw enforcement personnel. Media. Our Coordinator prepares articles for the local media and takes interviews from local radio stations. Copies of the articles are filed in the News section of this website. We contribute to the Revelstoke page of the WildSafeBC Facebook site. The Gleaning Project. Revelstoke Bear Aware volunteers are matched up with property owners to pick fruit, with the goal of decreasing bear attractants. Fruit is donated to Community Connections Food Bank. Identification and removal of wild fruit trees. We are working to identify locations of wild fruit trees and working with the relevant agency to have them removed. Workshops. Revelstoke Bear Aware hosts repeated offerings of special workshops on topics such as fruit tree pruning and electric fencing. 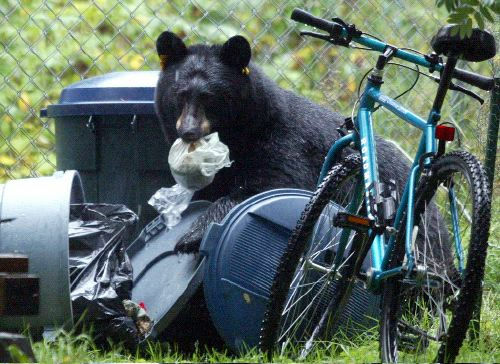 Bears can easily remove lids from regular garbage cans. The City of Revelstoke Waste Collection Strategy Committee. Revelstoke Bear Aware is a member of this committee. We aim to guide the community toward “Bear Smart” standards for waste collection. Bear Smart. Bear Smart is a voluntary provincial initiative aimed at encouraging communities to reduce the amount of conflict between people and bears by taking personal responsibility for change. The program focuses on six criteria that communities must complete in order to achieve Bear Smart Status. Includes development and annual updating of the Bear Hazard map, which helps us identify a geographic focus for our efforts.